Do you ever wish you were living someone else’s life? 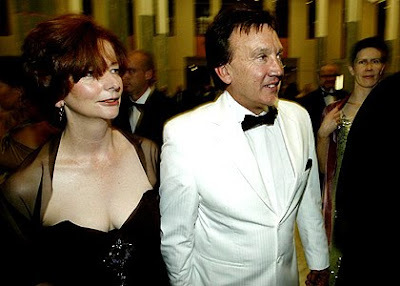 At the moment I am coveting certain aspects of the life of our new Prime Minister, Julia Gillard. Our first unmarried Prime Minister. Our first red headed Prime Minister. Our first Welsh born Prime Minister. And our first Agnostic Prime Minister. Leaving all the history making to one side, what I'm really fixated about is that Julia has the ONE and ONLY THING that I’ve secretly craved for my entire adult life. Julia's boyfriend Tim is a former hairdresser. He apparently blow drys her hair whenever she needs it and is well practiced at doing it at all times of day and night given her busy schedule. Not only that, but he does all the cooking as well (when they're not in official residence that is). Tim is some First Bloke it seems (First Man doesn't sound quite right does it or is that just because we are so used to hearing about First Ladies?). Anyway, it's a great appointment because she is a very talented person. But, doesn't the world turn slowly in this part of the world? When my daughter was six she wrote a letter to the then Prime Minister, Bob Hawke and sent him a drawing of herself sitting on top of Parliament House. She told him she wanted to be the Prime Minister when she grew up. Bob’s wife Hazel wrote her a personal note and told her that if she studied hard at school she may one day become Australia’s first female Prime Minister. Well I really didn't think it would take all these years for someone to beat her to it. Some mothers may dream of their children becoming world leaders. I never. This mother's only dream was that there be a hairdresser in the family.......(now you know I've never pretended to be anything other than shallow). It just goes to show that girls really can have it all .....lead the country and still manage to have great hair 24/7 too. Note: Surprisingly (to me anyway), there are currently 17 female Prime Ministers and Presidents in power in the world as of 24 June 2010. See here for details. This is too, too cool, Lilly! You Aussies are so much more advanced than we Americans. We NEED a woman in the White House. An agnostic one would really make it interesting, too. And a boyfriend who does her hair. This is getting better and better! Following the path of Indira, Maggie and Golda ! Great ! Great story, Lilly, first bloke indeed. Your new PM sounds fabulous and is gorgeous. A live-in hairdresser had me sitting straight up in my chair. Then you said he COOKS too and I nearly fell off my chair! OMG! That would be absolute paradise. I love a woman in power-- Don't think that'll happen in the US for some time though. We heard all about how much Sarah Palin's hair and make-up cost and what a up-roar that made. So if a woman runs again I'm guessing it will be a less glamorous one. Great to see you back my friend. Hope you and the family are all doing GREAT. The great thing about this woman is she gets on great with men and women and she is not so great looking that people will be fixated on her looks. although they are already fixated on her hair and clothes I see. She deserves the top job she is a skillful politician. I too would love to wake up with a hairdresser in the house. Where's Howard? He didn't need a hairdryer. @ Ocean Girl - ha ha, he went over two years ago, Thank Goodness!!! thanks for the post - I didn't know this about your PM. Sometimes we are lucky the "news" media (most of our news is pathetic) even reminds us of other countries. We were reminded Russia still exists because our FBI charged a large group as Russian spies. I don't even think we have ever had a redheaded President. I'll need to check. She certainly would not make it here with being single and agnostic. What is her political history. @ Kay, - I know how great would that be. As long as she is worth of course of the office. I always liked Hilary but it seems she was not that popular there. Politics can be brutal you would have to be one tough woman. @ Lady Fi - I wonder how long it will take now. @ Joanie M - well over the last 9 months I have been a slack blogger. Blog some, take a break, sblog some take a break. Life gets int he way of a good post sometimes. All my drama is out of the way ...for a while I hope so should have more capacity to blog. @ Christine - First bloke is a bit of a bloke other than his hairdressing pursuits. hope he doesnt let her down. She isnt beautiful but very interesting and of course has good hair. She said she would be a Prime Minister for "the people who play by the rules, set their alarms early, get their kids off to school, stand by their neighbours and love their country". She sounds like an amazing woman and given all her "stats" Your country is amazing choosing her as your Prime Minister. I cannot imagine anyobe who is a committed Agnostic being elected to anything here in the United States. The 'religious right' has taken such a toehold here in our country that it seems we are 180 degrees away from what we of the 1960's were all protesting...! So I say Bravo to your country and Bless this lady for having a live-in Hairdresser. I sure like the trend that all these famales PM are taking us. We almost had a female President last time. Soon, I hope to have another try at it. @ Aleta - half and half would be a good thing - truly representative of the population. @ Betty - you can say that again. Imagine from bed head to bouffant without even leaving your front door! That is my idea of bliss. @ Joanna - thanks and yes I am doing great. thanks for dropping by. @ Sarah - it will be interesting days. Of course once the gloss wears off (he he) we will see what she is made of. Hope she does well though. @ Lisleman - she is a lawyer who has a trade union background. Therefore is used to bargaining and conciliation I take it. I like her straightforward style and she ensues the qualities we Aussie hold dear I think, right down to her Aussie strine. @ Ayak - I know what you mean about being too good to be true. I hope he doesnt let her down - but apparently he is a man's man and makes her laugh, as well as do her hair. Now come to think of it he does sound too good to be true, he he. @ Banoffi - I like that quote. Thanks. @ Naomi - Strange how the world turns sometimes. Its interesting days for us here politically. Hope you are well and thanks for dropping by. @ Mike - aww thanks for that. I bet you are basking in sunshine over there and there once was a time I relaly loved dear old Maggie. She achieved great things too I guess and was one tough lady - poor old Dennis always tagged along. I hear Merryl Streep is to play her in a film about her life. Cant wait to see it. @ Peggy - I really like Hilary but that was from over here very far away from what was going on. I hope you get your female President one day. You made history with Obama so I am sure its not far off, lets hope, and that she is good! do you know its 20 years since Margaret Thatcher was in power in the UK. Amazing when you think about it isn't it? What was she called again, the 'iron lady' or something like that? I think women had to act like men all those years ago to get taken seriously. Times have changed. Fabulous post - great you're back in the saddle. I can't imagine how wonderful it would be to have a mate to do your hair and cook for you and to have the staff who must do the cleaning, planning and other stuff. Queen of her domain. He must be one helluva loving, secure guy. Apparently he greatly respects females so his ex wife says. He has three grown up children as well. It s good to see that politics can keep abreast with what else is happening in society and the politicians are not on this pedestal that they cannot possible live up to. A live in hairdresser would be even better if he/she gave massages as well!